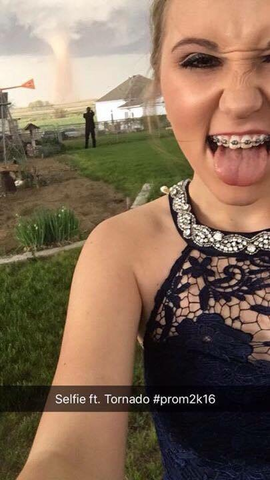 It's a prom photo unlike any other -- and a Colorado couple was able to capture a moment that will live with them for many years to come. 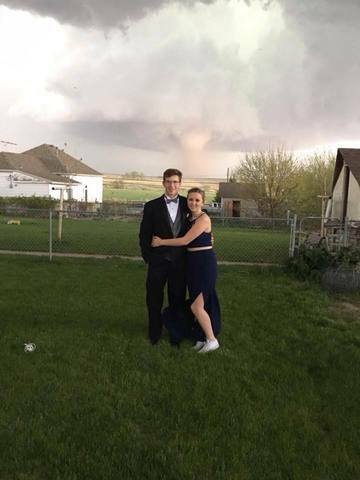 As several tornadoes were making their way across the Eastern Plains Saturday afternoon, Ali Marintzer, a freshman at Wray High School, was undeterred and braved the storm so she could go to prom night. Marintzer said when they first spotted the tornado, it was a small funnel cloud which quickly developed into the bigger tornado. 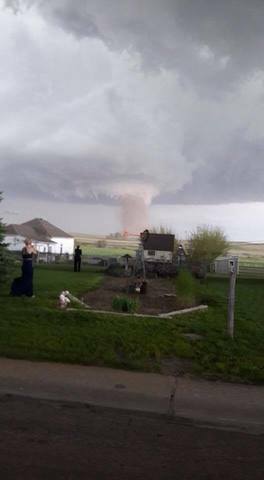 At an estimated distance of about 2.5 to 3 miles from their home, Marintzer realized the tornado never posed a danger to the family and once it weakened, Heidi took her phone out and snapped the shot of the teens with the tornado in the background, as seen in the photo above. Ali and Charlie also took the time to admire the powerful tornado after creating the epic photo. The prom was not canceled, but it was delayed by about 45 minutes to make sure everyone was safe, Marintzer said.